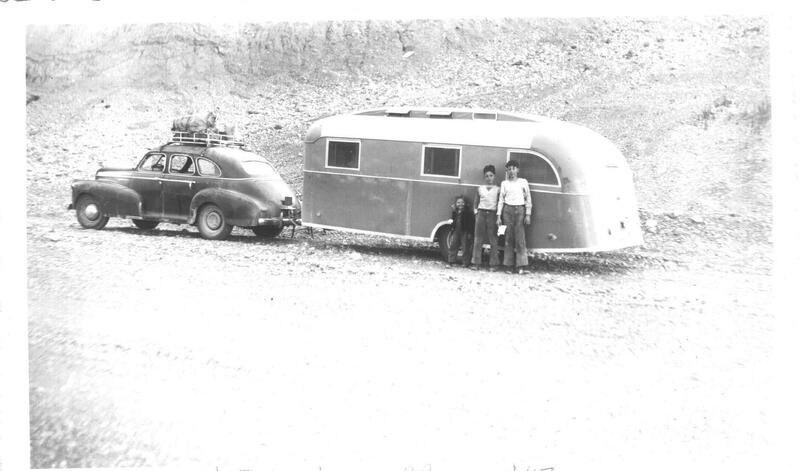 Alcan Diary - travel along with the Gough family back in the day when the Alaska Highway was just a rough, narrow two lane road. 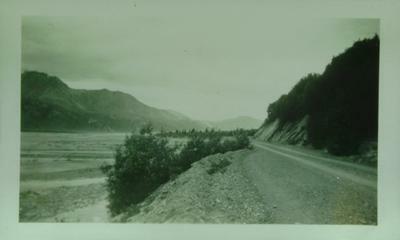 The following diary was written by Carola Gough, 1911 - 2007, as her family traveled the Alcan. They pulled their trailer from Anchorage to Spokane. In the diary, there is Carola's husband Gene, and their oldest son, Gene. Kerry and Linda round out the family. Left Anchorage at 6:45 P.M. Have house deal closed and did we hurry to get off. Called Marge Hoskins and decided to have supper with them at 9:00 P.M. at Palmer. Anchorage saw us off with a gorgeous sunset. Reached Marge's at 9:00 P.M. at the experimental farm 9 miles out of Palmer. Were we hungry and everything tasted so good! Boys slept in trailer and said it was OK. Saw three rabbits. Left Marge at 6:30 A.M. after coffee and doughnuts. Sure hated to leave her. Saw a duck already! Took a picture of a forest fire on Pioneer Peak. Mile 67 had breakfast and Gene adjusted trailer brake - made very quick sketch but need lots of practice. Just crossed Chickaloon River. Every car we meet has a plume of dust waving behind it. Took pictures of Sheep Mt. - lovely burnt orange color. It was three before we got away after lunch - never will get anywhere at this rate. Stopped at Glenn Allen to have trailer hitched welded so to save time, cooked dinner there too. Even Linda ate everything with a minimum of, browbeating. Straight down the road is Mt. Drum, to the left is Mt. Wrangell, and to the right is Mt. Sanford. Linda very interested in Alaska Indians we've seen on the road to Valdez. Stayed last night at Copper Center, down the river from the roadhouse. The roadhouse has a staircase of diamond willow, very lovely. I admired the watercolor originals by Ted Lambert. Today we may go to Valdez. Gene took pictures of Linda and a little native boy, also of fish traps. On way to Valdez saw a black bear in the road. We walked up to Worthington Glacier and touched it. Had our first flat tire at Tiekel from a puncture. Gene shot a rabbit for our dinner tomorrow. Well, here it comes, our first bad luck!! The rear end hasn't sounded too good so when Gene put it up and looked at it. He decided to go back to Anchorage and fix it. So here we are at Glenn Allen - the boys are fishing, Linda is digging in the dirt, so guess I'll paint some wild flowers. Gene will be back tomorrow, I hope. Afternoon - Pretty well finished sketch before getting the rabbit on to cook. It was good but tough. After dinner played rummy with the boys and put them both in their place! Washed everybody up and got to bed early but the darn mosquitoes kept me awake so got up and burned a rag which helped but the smoke was almost as bad as the mosquitoes. I think the boys scratched all night! Gene got back at 7:00 A.M. Car all fixed and loaded with goodies. Gene brought fresh milk and luscious bear claws - breakfast was yummy. Also brought a Coleman lantern. Alaska nights aren't so bright inside a trailer. Everything packed up and on our way by 10:30. We're on the Tok cut-off now. Just went through Slana - large patches of snow still on the ground. The grade has been very steep. Something went wrong and the car wheezed to a stop. Found that the overload spring had twisted and smashed the gas line so Gene to get out and get under again! No water with us so couldn't get dinner. We hope to make Mentasta Lake so will probably eat there. Made it by 8:00 P.M. a late dinner then went out on the lake in our rubber boat. Relaxing little ride and then to bed. Spent the day at the lake and Gene worked on the trailer brake and I did a washing with all the beautiful scenery to look at while I worked. Lunch and while Linda and Kerry napped, I sat in an old boat and sketched the mountains and Matanuska Lake. Didn't get it finished as kids woke up so went fishing. A wind came up and rain clouds, so we started paddling for camp. Got back just in time to get the wash in. Mosquitoes were terrible after the rain. Had supper and the doughnuts I made today. Pretty full day - boating, donut making, painting and washing - fun though when you're a gypsy. Decided to leave after supper. Dishes all done and everything ready to go in 35 minutes. Boys are lots of help but hate to do anymore than the other guy so have to keep everything even. Today was Kerry's day to wipe dishes. Took 3 slides of mountains and clouds and one of cabin and cache on Little Tok river mile 39. This road has such steep pitches that the old Chevy practically stands on it's hind feet and we pray that we'll make it to the top in low. 9:30 and the sunset is still beautiful. Gene says, like a flattened rainbow Reached Toc Junction at 10:30, customs office was closed but a man was working there so gave us our papers. Routed the skeeters and made the beds, Linda and Kerry already asleep in the car. Got everyone to bed by 11:00 or so. Had good night's sleep, breakfast and things packed up. Visited the N.C. store here at Toc and bought canned milk and candy, then on our way at ten. Took pictures of junction of Toc Cut-Off and Alcan Highway - later Tanana Bridge. Hundreds of lakes through here. Road very good. Stopped at Paradise Lodge to get gas Jasper hauled for us and filled all the cans. Gene and kids shot the guns - had lunch, then on our way. Just spotted an Indian camp. Big gene and Kerry went back to take pictures. Are now at end of Alaska and entering Yukon Territory. We've reached the Canadian customs office. Filled all the water containers at Snag creek just before we reached here. Made it to Dry Creek and decided to have dinner and spend the might here. Boys fished some and Genie caught a Grayling. Just had beds ready to jump into when a downpour came and the trailer developed some leaks - one over our bed, but as usual the Goughs had their good luck and a road commission garage was standing open just behind where we had stopped. So pulled in out of the rain and had the first dark night so far. We slept late again - just a lazy bunch - didn't have breakfast 'till ten. Then the car wouldn't start - battery haywire so had to maneuver the trailer and car and back it out of the garage. Road commission truck gave Gene a push to get the car started. Supposed to be good fishing up the road from here so will stay here and let the boys fish. Linda is happy - there's a huge sand pile to play in. I tied a spoon to a long strip of rag and tied one end to her wrist, so she digs and sings, happy as a lark. The boys, with much griping about cleaning fish they didn't catch, are down by the stream gutting and scaling some Grayling a man gave us. Kerry guts and Genie scales and they both gripe. Gene has the leaks patched with rubber cement. Fish all cleaned off for the creek to catch some on our own hooks. Very few mosquitoes here so it was most pleasant. Kerry caught a 14 inch Grayling, Genie caught five, daddy four, Kerry two. Genie had a 13" one. Caught all on flies. I sat on a cushion of moss and held Linda while her shoes and socks dried and she napped. Back to trailer and a fresh fish dinner - yum. I even whipped up a hot milk cake. Oven works swell. All had a bath in the old washtub and to bed early for a change, 8:30, for us 7:30 for the kids. We luxuriated reading in bed. Up at six to get an early start. Even the boys ate their cereal with canned milk. Stopped at Burwash landing to look around and take pictures of a mission. Stopped on a hill for lunch, as battery is broken and car has-to roll to start. Hope to make Whitehorse. Made a hundred miles by 12.30. Nearing Whitehorse by 9:30 but seems so much darker here. Reached Whitehorse and found a place so had a round of ice cream cones, found it was dark because we had lost an hour and it was 11:30! Also thought all day that it was Saturday and it was really Sunday. So tomorrow we will do the town. Such a bunch of dead pigeons! We all slept like logs last night. Boys and Gene went In to Whitehorse to see about a battery. Linda and I got breakfast. Such a hungry bunch! I made 17 pieces of French toast and then had to make 3 more when they finished those off. River barges go from here to Circle City. They drag only three feet of water. This river is the headwater of the Yukon. Prices much lower here, butter 65¢ eggs, 60¢, etc. Kids got little cars for 15¢. Made 101 miles from 3:20 to 7:20. Stopped at a creek that empties into Teslin Lake. Road follows this lake for miles. Lake is over 100 miles long, much of it unexplored. After dinner Gene pitched in and helped with the dishes and I made a pie and apple sauce out of dried apples we had soaking all day in cooker. Kiddies went out to play, all fine 'till we missed them - no sight or sound of them and this is wild country. We were so scared when they came sauntering down the road. I guess we looked so scared and cross that they didn't have a word to say. So set them all in the car until we had the beds made. It was all of ten thirty before they were settled. Up at six and on our way by 8:30. Made our 100 miles by 12:30 so had lunch at Rancheria. We'll soon be at Watson Lake. Came upon a brown bear in the road, a beautiful golden color. Gene got some good movies of him. Bought gas at Watson Lake for 65¢ per imperial gallon. Stopped at Highland river and cooked dinner then drove about 27 miles but it was raining and getting dark so pulled off on an old road and made up the beds. Developed some leaks again in the night after all Gene's patching the other day. Didn't get up until 6:45 this A.M. Still raining - decided the rain had come through the windows and dripped through the ceiling cracks. Kerry back to his solitaire already this morning. Silly Gene says that he can show Kerry low to play solitaire so stopped the car. We shall see. Ha! Ha! Gene was skunked. Road is terrible, wet and slippery. Up and down we go. Just passed cliffs where we could see coal. Looks like sunshine ahead. There's a rainbow against the mountains. Bought gas at Summit Lake. We had planned to fish here but they say there are no fish in the lake. Clemma must have meant Summit Lake, Alaska. So we'll go on and do our 200 mile stint - 20 miles to go. Across the mountains we can see for miles, trees, mountains, clouds, nothing but wasteland. Surely is lonesome. Stayed at an old road on top of the mountains, cooked dinner and stayed over night. Wieners and macaroni sure made a hit with everyone. Horses were wandering around here. The leader wore a little bell and Linda couldn't go to sleep for listening. Up at 6:45 and took usual 2 hrs to have breakfast and get started. Poor little Linda is so sleepy in the morning. The battery was down so Gene and boys had to push. Still raining but lighter than yesterday. Roads are so muddy that we'll be stuck if we hit much of a hill. Boys are at their solitaire again. Just had a blow out in one of our new tires. When off, found the wheel was broken. Gas at Fort Nelson and wheel welded at garage so fixed lunch while waiting. Hope we never have another muddy hill like we just came over - skidded so - I'm still shaking. Passed quite a large camp of Beaver Indians by the river - many horses and teepees. Stopped at Sikannie River for dinner and the night Parked high up on the bank. Of course old worry wart me had visions of sliding down into the river. Unhooked the trailer and drove down an old road to river for water. Talked to three fellows heading for Alaska from Oakland traveling in a jeep-truck and a trailer. See lots of little Jeeps pulling huge house trailers. Slept in this morning we're all so tired. Raining again this morning. We go from a downpour to sunshine in a few yards. Stopped at Beatton River, a Royal Mounted Police stop At Mile 100. Bought lunch stuff at Charlie Lake to eat on the way. Five fresh tomatoes for 35¢ - civilization, at last! We can see Fort St. John in the distance - not on the main highway. Quite a town with wheat farms all around. My, it seems good to be back to where people live! We went through such a stretch of wasteland. Just crossed the Peace River - took pictures of the bridge. At last we are in Dawson Creek. Had to stop at garage for new battery. Then on to a store while Gene fixed brakes, only to find we're two hours behind time so everything closed. Managed to catch a butcher's eye and get a dollar's worth of meat. Got milk at an ice cream store and bread at a cafe. Put kids to bed in trailer but Linda didn't like it so brought her up into the car. Hit muddy roads, however it wasn't too far to dry roads so went on to Grand Prairie and spent the night. Had flat on the trailer this morning so I got breakfast and trailer picked up while Gene fixed it. On our way about 9:30. Grand Prairie is quite a town, larger than Anchorage. Just ferried across, the Smokey River. Had another blowout on right rear near Sturgeon Lake. Rim broke again but casing looks all right. Stopped Pt High River to fix tire - bought new wheel and tube and welded hitch. We've been traveling along Lesser Slave Lake. Mostly Indians here, tents, cabins, wigwams. Stopped at a little place on Slave Lake to have gas tank brace welded. Had supper then went to a place to get water. Here we were shown a mink farm. Mr. Murry was the owner. They get fish (Whitefish and Tubelars) from the lake. These they grind, mix with cereal to feed the mink. Mr. Murry had standard, pastel blues, cross and 95% white. He gave us some Whitefish. Tubelars aren't good people food. They look like whitefish but have almost no lower lip. Went on for twenty miles or so and decided to stop for the night. Rain woke us up at 4:00 A.M. - decided to pick up and leave as this road to Edmonton is impassable if wet. Drove out of it by 6:20 so stopped for breakfast. On our way again in the usual two hours. Roads have been washboardy. Have another crack in the trailer hitch so are having it fixed at Clyde, Alberta. We'll have lunch here and make Edmonton this afternoon. Welder asked only 50¢ but Gene gave him a dollar. Certainly a difference from Alaska. Concrete at last! Gene is practically silly, he's so glad to be on smooth roads. Edmonton at last. We've found a perfectly wonderful trailer park, all grass and trees and only a dollar a day - showers, toilets, hot water, and civilization at last! Got the boy's clean clothes out and sent them to the shower. Linda and I washed our hair in the shower. My! How she enjoyed it! Feels so good to be clean again. I made supper while Gene showered - dishes done - kids in bed. We will go for a little walk, then to bed. I'm so tired and nervous I can't sleep. Slept until almost ten, had breakfast then took laundry over to be done. Gene insisted that I was too tired to do it and I was. We can get it back tonight. Been into town intending to shop but found everything closed as tomorrow is Dominion Day and there is a three-day holiday. I noticed in the paper that on Wednesday the stores are closed after 2:30. Things are so much cheaper here and people are very considerate. Bought strawberries and cream for dinner - so good. After dinner we are going to the show but have to wait for the laundry first, it wasn't done when Gene went for it. Laundry man just came and the towels are nice and dry but everything else wet. They misunderstood - why they would think we wanted it wet, I don't know. So Gene caught him and he took it back to dry. We get it 8:30 tomorrow. Tonight we'll sleep sans pajamas. Show was pretty good, ice cream afterward. It was 8:15 when I awoke and Gene has to get the laundry at 8:30. Had to wake him up. We're off for Calgary today. Stopped under a huge tree by a dairy for lunch. Milk, two quarts for 25¢, so we really guzzled it, imperial quarts, too. Butter and eggs, so fresh and so cheap compared to Anchorage. Stopped for gas and found we almost had a flat. The fellow fixed it for 30¢. Amazing, these Canadians! Raining in Calgary. Finally found a nice trailer park at a dollar per day, grassy but not many trees. Boys were begging for wieners and beans so found some canned ones and had supper, a shower and to bed. A gorgeous aluminum trailer next to us - going to Alaska. The man was full of questions and beer. Looks quite the man about town, his wife very smart looking. They're from Florida, have a baby. Our trailer looked pretty good 'til compared to this luxury liner. After breakfast Gene went to garage to get brakes and tire fixed. Planned to do some shopping but found that the stores close Wed. afternoon so employees work Sat. afternoon. So decided to stay over another day to shop. No butcher shops open so had to have creamed tuna again but did find fresh fruits and vegetables - strawberries, too. The boys went wild! All the kids in bed a bit earlier. The wind is blowing like fury. Gene and I hiked to the top of the hill and back down the road, then to bed. Today the stores are open so did our shopping. Sox for Linda and Genie, jeans for Kerry, jacket and pants for Gene but couldn't find pants for Genie. Bought some nylons and some crocheted - loves like I've always wanted. This big city wears the family out. By the time we had lunch and were ready to go it was 3:10. Just entered Banff National Forest. More beautiful here than Alaska. Genie said, "There's a place where a bear ought to be" when we saw one! It was digging ants out of a dead stump and didn't even bother to run. Raining when we reached Banff - beautiful here. Had supper late, took a walk, and then got family to bed. We went downtown for a bit and widow shopped. The camp is on top of a hill about two miles from town. Boys bought souvenir rings, got Linda a spoon. Afterward we toured, on foot, rock gardens and museums as well as both sides of the street. We were all tired so went back to the trailer and had lunch and put chicken on to cook in pressure cooker. Will fry it for dinner. Linda had a nap then we drove to the animal paddock. Saw some bear but no buffalo, lots of pasture. Back home to a chicken dinner, then a walk and to bed. Decided to stay here today. I want to be lazy today. Morning work done so I got out my paints and spent the morning sketching, also got a good sunburn. I was sitting in the sun. Felt so good to soak it up. Gene went to the post office. Came back with plans to go fishing. So I finished my painting while Gene and the boys got a lunch ready and fishing gear together. Fun to sit and let someone else prepare things. Drove to mile 7 from Banff, then carried boat, lunch etc. down hill to river where we inflated boat and loaded up again. Crossed river and went up small channel to a beaver dam. Here we had to unload and pull the boat over the dam. We found a good place to fish, saw scads of them but they wouldn't accept anything we offered. We did see moose, though. On the way back Genie - stepped-off and hung on behind. Kerry was scared. Genie felt like a million! Back to the shore and hiked up the hill - 'bout did me out. Saw beaver working on way back, also moose very close. Gene and kiddies went down to watch but I couldn't get up the energy to climb the hill again so stayed in the car. Off for Lake Louise today. Very nice campground here. Got settled - headed for the lake. Funny thing but seeing it the second time is not so thrilling as the first. Still beautiful but we've seen so much beauty. Linda is so thrilled with the glassed in swimming pool, we could hardly drag her away. Terrace in front of chateau is a mass of orange and yellow Iceland poppies. Decided we are all too hungry to go for a hike so back to camp. This family is always hungry, Dinner over so got Linda to bed for a nap. Gene washed the car and trailer - got rid of the Alaska dust. Linda up so decided to ride up to lake Moraine. This lake is really set in the mountains. Rock cliffs go straight up from far side but on roadside a little path follows the lake edge. Beautiful trees, even wild violets. We're practically drunk on beauty! The boys found a small stream to dam up so caught up with us later. The lake is the same turquoise blue as Lake Louise, really most beautiful, I think. Back to camp - much said about noodle soup I fixed with chicken stock for our supper but everyone ate it. A bit salty at that but not bad. You'd have thought it was medicine, the way they went on. Decided we had seen most of the Lake Louise points of interest so up at seven and on our way in the usual couple of hours. If we find a nice stream we'll stay over tomorrow and let the boys fish. Just left Alberta and entered British Columbia, Kootnay Natl. Park. Crossed the source of the Columbia River at Canal Flat, B.C. Thought we would see a nice place to camp tonight but went beyond Cranbrook to Moyie Lake and found a lovely spot there. Went fishing but no luck. On to Aunty Pearl's at Spokane and a breather after our long, long trip. The family returned to Alaska and Gene, the oldest son, graduated from Anchorage High School in 1952. Gene went on to join the Navy in 1954. In 1957, he returned to Alaska for Thanksgiving, and then again in 1998 for his Anchorage High School reunion. Check out these Alcan Highway Stories right now.